Crystal clear congruence at the London Court proceedings of today with our critic to Reinfeldt’s involvement in the Assange case (Professors blogg, Feb 9). Although the issue should be penetrated deeper I hope Assange’s defence will prevail. 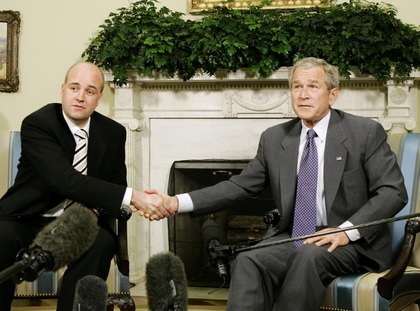 On the other hand Fredrik Reinfeldt has tried a few times to give the notion that his government is “neutral” in the matter. He had to lie to assert such statement. Everybody in Sweden knows however that Sweden is not only not-neutral any longer but also a proven and active subservient collaborator of the USA judiciary, their international political police (CIA), the USA military (including USA/Sweden joint-occupation forces in Afghanistan), not to mention the USA-controlled multinational corporations whose commercial and financial ventures in and by Sweden – for Sweden’s own detrimental as independent trade mark – are the everyday’s national disgrace. How then, how could ever the same Reinfeldt, in the very same Expressen (article of Feb 8, 2011, headed “Reinfeldt disappointed with the picture that spread on the Swedish Judiciary“) pretend being so surprised about the world-wide spread characterization of Sweden as having nowadays its official authorities and institutions at the service of the USA? Sweden killed Palme to sell her soul. Some opportunits wish now to sell her body. We will stop that with the help of Wikileaks, and this is a primary reason why we have to help in FREE ASSANGE NOW in a fair proceeding! Let us retain Sweden dignified, neutral, democratic, republican, and sovereign! February 11, 2011 in Uncategorized. >In Nuremberg, we learned that one cannot say that you just obeyed, one must also think about the consequences of their actions. Arguments similar to Reinfeldt's comments that the legal system just puts the Swedish law into practice would have saved the lives of many in Nuremberg, if they were valid. If it is possible to arrest a man claiming probable grounds because of two ruptured condom which occurred in the middle of a suite of intercourses with two women, then one may ask if justice exists for men in Sweden.